Percy Jones grew up in Abbey cwm hir, Wales. He studied electronic engineering at the University of Liverpool before joining Liverpool Scene in 1967 He was a member of jazz fusion band Brand X from 1974 to 1980, and a reformed version which lasted from 1992 to 1997. He was in NYC based band Tunnels from 1990 until 2005. Still residing in New York, he is currently a member of MJ12. Jones is best known for his unique fretless bass sound. 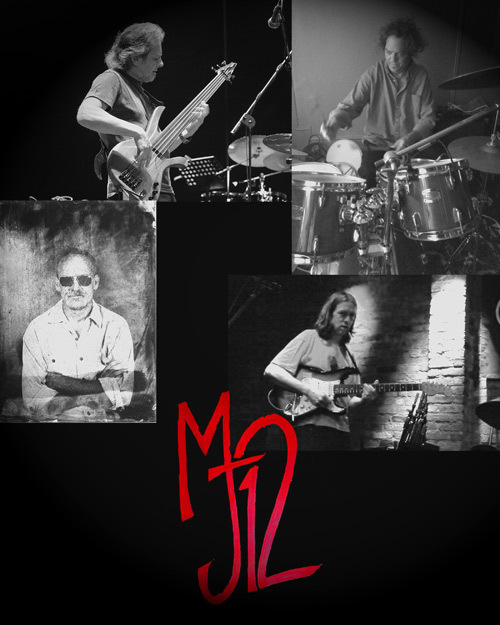 Jones was also briefly a member of the jazz fusion group Soft Machine, and has contributed to recordings by David Sylvian, Brian Eno, Steve Hackett, Roy Harper, Paranoise, Suzanne Vega, Richard Barbieri, Nova and Fovea Hex, amongst others. After several years playing as part of “the loft jazz scene” in NYC with the likes of James Chance, John Zorn, Phillip Johnston, Eugene Chadborne, Ken Simon, Dave Hofstra (and many others) Stephen started getting busier with more rock and jazz/rock in the CBGB’s scene with Giant Metal Insects and Quality Trio with Jim Matus & Percy Jones. Alice Donut formed after that and took Stephen on the road and the studio for several years and a dozen albums followed by a few tours with Rasputina. Then a few years ago Stephen rejoined Percy to do what we do today. Guitarist David Phelps is currently a member of Peter Apfelbaum’s 11-piece band The New York Hieroglyphics, which includes many of today’s best creative musicians, including drummer Dafnis Prieto, bassist Patrice Blanchard, trombonist Josh Roseman and vocalist Abdoulaye Diabate. Their newest album “It Is Written” was released in August 2005 on the ACT label. He also leads his own band the Eclectic Troubadours. David grew up in Denton, Texas, the home of the University of North Texas, formerly known as North Texas State. As a youngster, he started playing the bass clarinet and later played in bands with many of the children of North Texas faculty members. David, along with his twin brother, bassist Drew Phelps, attended North Texas, studying with Rich Matheson and guitar guru Jack Peterson, among others. David then traveled to Alberta, Canada where he studied at the Banff Centre with jazz greats Dave Liebman and Dave Holland (both Miles Davis alumni). He also studied with John Abercrombie, Steve Coleman and Kenny Wheeler. Brooklyn based artist/ musician Jack Warren’s art and music revolve around borderzones, places where often dissimilar elements are forced to interact. He finds that the potential energy inherent in these moments inevitably leads to places of greatest personal inspiration. He has worked at the following. Mavara, is Irans first premier progressive rock band. The name Mavara translates to beyond everything you think which speaks to the essence of their music. The band was formed in 2001 by composer/keyboardist Farhood Ghadiri and over the years has had a fluid line-up of members, performing extensively in Tehran and Karaj. Currently Mavara is comprised of Ghadiri along with Ashkan Hamedi/vocals, Sina Khodaiefer/bass, Anis Oveisi/keyboards and Americans Scott Abene/lead guitar and Jim Welch/Drums. Because of their unique sound and talent, Mavara quickly gained notoriety in Iran, receiving acclaim from the Tehran Industry and Science University as Best Rock Band at a Live Performance. Additional honors include an invitation to perform for the internet music festival, Teheran Avenue in both 2003 and 2005. Their music is best described in terms of their influences, with a generous helping of Pink Floyd, Porcupine Tree and Marillion being the first bands that come to mind. In other words, more on the melodic side of Progressive Rock. Mavara began recording their first Persian language album, Ultimate Sound in 2003 which was released in 2005, and gained recognition in an article published on the website Zirzamin.se. Later in 2005, Mavara teamed up with the band Aavaar for a benefit show in Iran to promote the new album. It wasn’t long thereafter that the band began recording their first English language album, Forgotten Inside, which was released at a private concert in 2009. Among their first tour stops, was the Crescendo Music Festival in France during the summer of 2010. 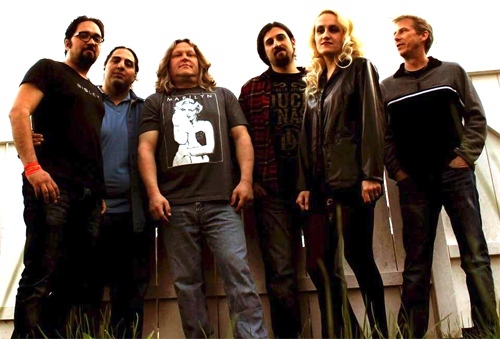 In 2013, Mavara released their epic third album Season of Salvation, on Transit Music Group Records [TMG] and is currently based in New Hampshire, promoting the album here in the United States. and is currently touring in the United States. During these days Mavara work on their 4th studio album and finish new single song called Mandatory Hero. Since arriving in the American soil, the band has been the subject of television programs [NH Chronicle/ABC Television, Stir It Up on MCTV, etc], College radio live appearances [Tufts University, etal ] and countless magazine articles, The Hippo, The Union Leader. Huffington post, Daily Telegraph etc.and most recently were featured in Spotlight Magazine where they graced the cover of the weekly magazine. Mavara was also invited to be one of 8 bands to perform at the prestigious “ProgDay Festival 2013” the longest running progressive rock festival in the world.